Relate: It was such a beautiful view. I found a perfect climbing tree near the top of a hill that allowed me to look out past the canyon. There was a near perfect sunset and every time I climbed a little higher it seemed the view just got better. I was already high enough in the tree that I could feel the sway with every gentle breeze. Things were almost perfect. there was another branch just a little higher, if I could make it to there I knew things could not possibly get better. That was when disaster struck. As soon as I shifted my weight to step up on that higher branch I heard the crack of doom. I quickly tried to step back down but the added weight I had put on the branch in my left hand caused that branch to snap as well. Before I could react, I found myself falling backwards. I fell maybe five feet before my back found another branch that could not stand against the impact. It also cracked but already my body was spinning and I barely managed to get an arm up before another branch hit my face head on. This time, the cracking I heard was my arm, not the branch. I did not at first notice the pain through the panic. It was only once I was laying on my back on the ground trying desperately not to black out that the pain in my broken arm, as well as my back and my forehead and my… that foot should not be turned at such an angle. React: How often do we do this in real life? God, how could you let that accident happen? Is it his fault that drunk got behind the wheel? Why did you let me lose that job? Why didn’t you let me get that promotion? Was He the one who took twice as many breaks that were twice as long as the company policy allowed? Was He the one who was getting paid company money every day to spend two hours on facebook? How often do we want to keep God out of our lives and then turn around and blame Him as soon as things go wrong? How many of the “why does God allow evil” type questions really come down to “why did God not intervene in our personal or national stupidity?” Is it perhaps time we grow up and take responsibility for our personal, cultural, and national sins? 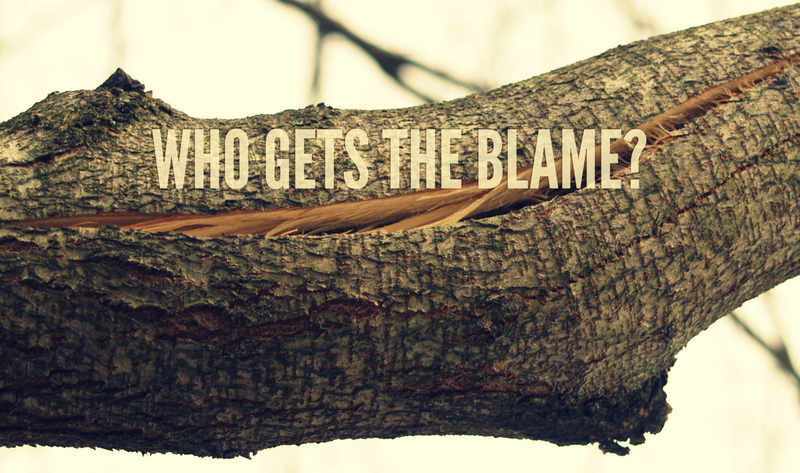 When will we stop blaming others for the things we have a responsibility to stop? You are good. I know this. I know that I know it. And yet I still seem so quick to blame You whenever things go wrong even as I forget You while everything is going right. Please forgive me for this. Forgive me for not recognizing Your nature at a heart/gut level even as I cram more and more information of who You are into my head. When things are going wrong in my life, help me to be faithful to trust You. When things are going well in my life, help me to be quick to praise You. No matter what is happening in my life, help me to always reflect You. Confirmation of individual responsibility and accountability! Amen! We were created with free will. That’s why starting my day daily Bible reading is so important! I love that, “I gave you a brain, it’s not my fault you didn’t use it.” It could be applied to any of the gifts He gives us that we fail to use or even misuse. My sister sent me something in response to some pain that I recently shared. “God can help you turn evil that happened to you into good that can happen to others.” or something like that. It was really beautiful, I’ll see if I can find the exact quote but honestly I know I was given a trail, the trail has made me pursue and strengthen certain of my gifts, and now humbly ask God to guide me in the application of these gifts so that others may be free from the pain I suffered. … oh God why did you let Beejai write two blogs worthy of reblogging that I just read today one after the other? Lol. I know the feeling on that one. Why? why? why? Why not? it is then we become appreciative of the goodness of God.